No. 2 Mine - Closed since 1949, the No. 2 Mine is now prepared for underground tours. It officially opened in the Summer of 1998. 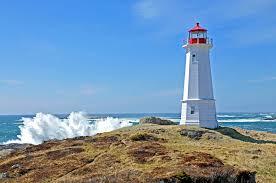 The Lighthouse - It is one of the most picturesque spots on the island. The Murals - To help revitalize the spirit of Bell Islanders a murals project was undertaken a few years ago. Throughout the town, painted on prominent buildings and structures are several large murals depicting the rich history of the island. The latest mural to be unveiled, "On the Hub" is 50 feet long and eight feet high. It is a real masterpiece. The detail will amaze you. The Seamen's Memorial - At Lance Cove at the southern end of the island, it commemorates those killed in the U-boat attacks of World War II. The Legion - Many items commemorating the sinking of the ore carriers by the U-boats of World War II can be seen. The Sunken Ore Wrecks - Scuba divers can visit the sunken ore carriers. The Collar to No. 4 Mine - Near the airstrip, it's a remnant of the mining operations of years ago. The Sports Hall of Fame - Located at the Curling Club on Petrie's Hill, it displays memorabilia from Bell Island's rich sporting history. Located in the middle of Conception Bay, Newfoundland, Bell Island's terrain and coastal structure allow bird watchers the opportunity to find many different types of birds not normally seen in a single location in other areas of the province. At the ferry landing, and especially on the cliffs adjacent to the Lighthouse, the bird watcher can view the nesting colonies of the Black Guillemot; at the Grebe's Nest site - hundreds of starlings flying from nearby fields to nests located in the cliffs; or the beautiful great black-backs at the Bell at the southern end of the island. Wandering around the island one can frequently see different sandpipers and snipe. The grassland sections of the island offer one the opportunity to see kestrels and merlins and many different types of sparrows. In the forested sections of Bell Island look for robins, grosbeaks and woodpeckers. No wonder Bell Island is becoming known as The Belle of the Bay. Trails - Some of the best scenery around can be enjoyed on a stroll along the cliffs and beaches. 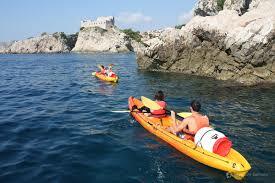 Sea Kayaking - Bell Island offers an ideal place for sea adventure. Towering cliffs, birds, whales and caves are just some of things you can see. There are plenty of small beaches around the island if you want to come ashore for a rest or just to explore.